A group of regulars has raised enough money to buy their local pub in Essex. 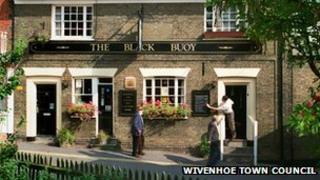 About 40 people are now involved in the consortium formed to save The Black Buoy in Wivenhoe, which was originally on the market for £350,000. The consortium plan to employ a landlord in the hope of reopening in November after a refurbishment programme. John Moores, consortium spokesman, said: "Getting the initial cash to buy it was good, but we need to refurbish it and there is money put aside to do that. "The whole thing needs a good tidy - the carpet, kitchen, toilets, bar, cellars, fascias - as it's a 500-year-old building that's been very neglected. "We're not right on the River Colne, but hopefully once we've built up a decent amount of regulars, it will also become an attraction for people who want to visit Wivenhoe for a walk and have a drink or lunch afterwards." Mr Moores said the agreed sale price was being kept confidential. The consortium was formed last autumn when Punch put the pub on the market. A Punch spokesperson said: "Whilst we are waiting for a sale to complete, we currently have a temporary operator running The Black Buoy as it is in our interests to keep our pubs open and trading."